Cigarfest is one of the times when you truly can see the awesome camaraderie that is held in the cigar community. From beginning to end, it’s a testament to how giving and open people can be. And what’s not to love about it – cigars, drinks, meeting the growers, women in scantily clad outfits, prizes… and all of the proceeds going to charity. This year’s festival was no different than the last in terms of how it feels to be part of an event like this. Actually one might argue this has been the best one yet. With a bevy of events going on at the CI downtown store, the CI superstore, the Wooden Match, and even up at the Split Rock Resort – there was always something going on that you can be doing. Just for example - Nick Perdomo held an event one night at the superstore, while a Drew Estate event was going on at the downtown store and they are always well attended and well received. Instead of hitting all of the events, my uncle, brother, and I decided to just relax at the superstore on Thursday and have some cigars and a few beers (it’s a BYOB establishment). We snagged a few seats near a couple of guys who were chatting. We got to talking with them and found out that they (Clark and Bill) were in from Ohio and that they travel across the country to attend various cigar festivals. We talked through favorite cigars, beers, mixed drinks, what we do for work, etc. It was a really good time. Since they were from out of town and didn’t have a car there, I offered that if they wanted any beer, to feel free and have some… they took advantage of that offer, but handed me a Liga Privada No 9 as a thank you. Again, another testament to the sharing that goes on – I was happy to share some beers with the guys and they were just as happy to pass on a cigar. I got some info from them on some people to contact to get some Feral Pigs, etc. too. So all in all… it was a successful pre-event. · The food was good yet again – BBQ chicken or pork, potato salad, coleslaw, beans, kielbasa, etc. · 5 Vegas gave out the Limitada 2012. From accounts of people there, it was on par with the 2008 version, which seems to be a fan favorite. · The CAO guys remembered me from last year, and after chatting for a few minutes tossed me a bag of their Italian whole bean coffee. · Some viral marketing went on with stickers everywhere that say “who is Ramon Bueso? “ along with his website. I smoked the cigar this weekend and I’ve got to tell you – I’m preordering a box or two. Expect a review from me in the next day or two. · Man O War had a friend of mine there rolling fresh rolled cigars, but they ran out of wrappers. I got lucky enough to try a one of a kind cigar because of it – he rolled me a cigar with the guts of a Ruination and the wrapper from the Ramon Buseo (who happened to have some extra around). For the cigar that was being given out otherwise, I was happy to see it was the Side Project, the 52c. · Gurkha was a big draw booth as usual, giving out signs, tshirts, flags, hats, and cigars. I was fortunate enough to snag a shirt and flag from the melee. · The Room 101 booth was rocking for quite sometime, chanting 1-0-1 and One Shot, One Kill. As people chanted they tossed out tons of their San Andreas cigar. It was almost bedlam at times. This was the first year another booth rivaled Gurkha in any way. Last but certainly not least, I have to mention meeting with Jonathan Drew. Oddly enough MattyBlayze from /rcigars caught us up there talking with him and of course had to post the pictures.... But anyhow... my brother wrote a nice article on our talking with him. · While waiting in line, the guys we talked to at CI a few days prior, Clark and Bill, happened to pass by. To return the favor of the previous day, they bought my brother and I a drink. Very cool dudes. · The guys in line were hilarious. Had a great time BSing with them. · Jonathan Drew bought everyone in line a round as a thank you for waiting and gave the bartender a 35% tip on top of the bar bill for the 25 or so people in line. · 2.5 hours to meet with Jonathan Drew seemed like an eternity, but after meeting him and talking to him, I know why. He is extremely passionate about his work and really wants to connect with everyone that smokes his cigars. He spent about 20 minutes talking with us. · Drew’s feeling is that 10-15 years ago it was all about the big cigar companies, but slowly the boutique brands have whittled out their own niche and they keep growing it. The guys have all held a tight bond as boutique manufacturers and have made it a point to really stay in touch with their roots (making quality cigars) and really interacting with fans and haters alike. · I don’t know if it was the bourbon talking that he was drinking, but he gave some really straight direct answers about the way some of the industry works that were shocking (from tobacco age, to number of lines certain growers have, etc). 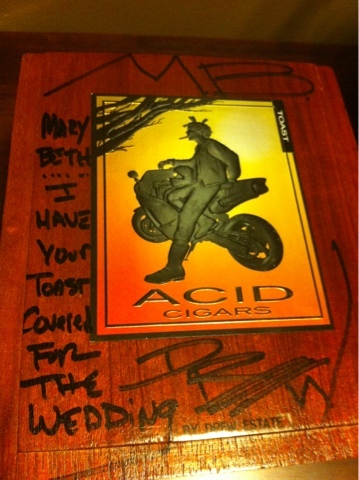 · I told him of my upcoming wedding on June 9th, and that my fiancée loves his cigar “Toast”. So, he offered to send me a box (with cutters) for the wedding, and gave me instructions on how to go about getting it. He even wrote out a nice little note to my fiancée (seen on the right) on the empty Toast box I had him sign. · When we were done chatting with him, he gave both myself and my brother a big hug and the following cigars: Liga Privada No 9, Acid Blondie, Acid Blondie Belicoso, Naturals English, and a Tabak Especial. Really fantastic guy. In all, I walked out of there with 75 cigars, a humidor, an ash tray, duffel bag, Gurkha tshirt, Gurkha flag, an lb of CAO coffee, some great memories, and a promise from Jonathan Drew to send off a box of cigars for my wedding. Even if it never comes, the experience was amazing. Your Toast will be "En Route" tomorrow, my friend. Have the best day ever. im looking forward to it. you sure you dont want to attend and deliver the cigars personally?